Last Monday we have spent a very interesting GENETHON day at our R&D center breaking out of daily routine and spending whole day on a free and publicly available tool that we are proud to present today…Geneza Compression Analyzer. Analyzer itself is available through HTML5 interface with no plugins or downloads needed. Many times we are in a situation where we have to quickly show the effect of JPEG compression on an image, specially with a mapped pixels that have changed. Those of you that have met this situation, we are sure you will appreciate the ease of use and speed of this tool. 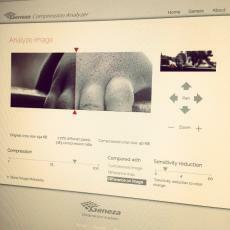 Compression Analyzer allows previewing of compression artifacts on original image in several interactive modes. Choose the compression ratio and mode of difference display to freely analyze and enlarge the details. If users wants to retain their images in the system for longer than 1 hour, then they need to register. Registration is absolutely free ! When we find some more time, we will add a display of detected JPEG compression level on original image that was uploaded.